Ah, you've arrived in Europe. And after much hearty traveling and securing yourself a cozy flat, you suddenly find yourself with the big American need to pig out. You decide, in order to save money for the ridiculously expensive beer menus in this town, you'd like to bake yourself out of hunger. BUT WHAT'S THIS?? YOU DON'T KNOW THE METRIC SYSTEM? Step 1: Find your recipe. 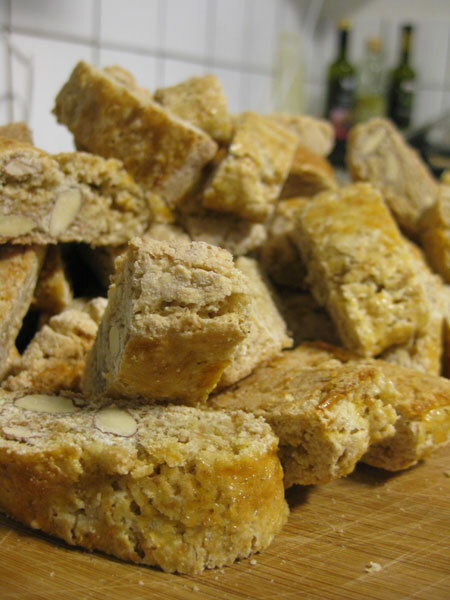 Thanks to my mom, I chose to use an old favorite of mine, actually taught to me last time I came to Europe: Italian cantucci (biscotti). This is how I started my first quest: How much is actually in one American cup? A good friend with blonde hair and an incredible sense of style once told me that you have to vary your baking practice depending on what you're measuring. Apparently in Europe, not only do they use milliliters (or mL, as I will hereafter refer to them) for wet ingredients, but they also use grams for dry ingredients. Grams. Like, you need a scale and weigh it out. Roadbump one: I had no scale. After staring at my kitchen cabinets in denial, I turned back to the recipe. (Warning! Science!) Even if all my different dry ingredients varied in density, I realized that they were all measured with the same volume (whatever 1 cup was) and so if I kept the volume measurement the same, I could add everything in the same stoichiometric quantity. Basically, I could keep my flour-to-sugar ratio. Woo! (This conclusion merited a celebratory shot of vodka). After a bit of sleuthing on the Internets, I determined that the measurement I was dealing with was, firstly, the "traditional American cup," and typically varied between 236-237 mL of volume. I also found out that a teaspoon is 1/3 of a tablespoon, and was around 5 mL. Step 4: Pre-Heat the Oven. You've got your Swedish ingredients. You've got your converted recipe. You've got your bowl and your baking trays. So now, first, turn on the oven---oh wait. It's Celsius. Plug and chug, baby. I got 180. This process should be very familiar, with the giddy exception of using the incredibly cute (milli-cute, if you will!) 1 mL measuring cup. Step 6: Bake. Watch. Bake. Watch. Step 7: Cool, cut, and revel in your success. It worked. Take that, metric system! Nina's got you served. Of course, this is all without a scale. Soon, when that gets in my hands, I'll post an updated version. But for now, do not despair: you can make your American recipes, moreorless the same as back home.